Each month you can just pop in for 10 minutes during one of our Teeny Tiny days, and we’ll supply you with one print resolution digital image after each session. Sessions are priced for one child only - If you’d like to have more than one child photographed, you’ll need to pay for each child separately, $30 per child. You get one digital image for every $30 you spend. The chair, background and setup is the same each time. Every now and then we’ll have special Tiny Mini sessions, like Easter/Christmas or other special occasions. We’ll let you know about these via email and Facebook. We’ll have just one Teeny Tiny day each month so register now and you can be the first to know each month. You’re probably asking yourself WHY the "Teeny Tiny" session is so much cheaper than a regular portrait session? Teeny Tiny's are a one stop shop, the setting is the same each time, in studio, you arrive ready to go. We pop them into the Teeny Tiny space and whip out our best tricks to try and get the smiles/reactions/facial expressions in the 5minute shoot time. You choose which image/s you would like then and there we send it out right then (or if we are pressed for time we will choose the best image and send out by the end of the day). It’s a full resolution digital image that is ready for you to print, share online or gift to family and friends. We also do custom framing so you have the option at the end to combine all the images into one frame and document the changes of your babies first year or two. 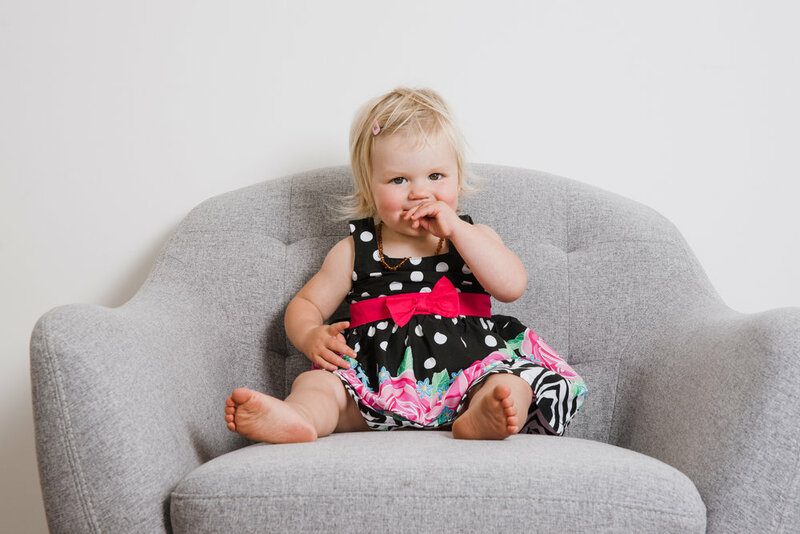 Full Portrait Sessions and our Baby Programme options are a lot different. They have a more lifestyle/relaxed feel to them and can be out on location, at home or in studio - you choose. They generally take anywhere between 40-90 minutes, we take a lot more images and there is extra time for small children (or parents!) to warm to the camera. There is flexibility in numbers, bring Grandma and Aunt Julie along for no extra cost. We guarantee that you will love what we capture for you on the date and if you don't we offer a re-shoot. After a full portrait session, we take the time to go through the images and choose the best to show you the following week at a viewing session. From here you choose the products you would like and place any orders. This takes roughly an hour – depending on how decisive you’re feeling. So Teeny Tiny sessions are quick, easy and fuss free. and can be a fab affordable way to document babies first year. They also make great in between shots for our regular families that return every couple of years. Full Portrait Sessions take a whole lot more time, heart and energy, but you end up with a rather beautiful, personalised, set of photos of your family at that time in life. • It’s $30 per child, regardless of how many children you put on the chair. If you have two children, that’ll be $60, three children is $90 etc. You get one digital image for every $30 you spend, so if you’ve paid $60 you can choose two images, $90 gets you three images..
• Concession cards purchased are valid for two years from purchase date. That means if you miss a month, it’s no big deal. In fact, you can miss every second month and it’s still OK.
Once two years have passed, you’ll lose any sessions you haven’t come in for though, so do keep that in mind. That way we know it hasn’t been stolen too. Teeny Tiny sessions you will have plenty of warning and you still have unused shoots we’ll make sure you have something nice for your remaining credit. • Teeny Tiny sessions will be done primarily by Lydia, but Stew will fill in if necessary. Either way, you’re in good hands. when they’re just brand new. Once they’re 6weeks old, we can start them up on the Teeny Tinys. smiley self. But we’ll do our best! true representation of your child - We can polish away an untimely graze or bruise, if absolutely necessary. But as a general rule we won’t be changing things. With this in mind, you may want to make sure you any little faces have been cleaned before they come in! reproduce any image you purchase from your sessions for your own enjoyment and that of friends and family. please tell us when you sign the contract. That way there’s no confusion and you can then be sure your images will remain private. • If you would like your Teeny Tiny image as a print or canvas, you have the option to order that. Let us know and we will email you the prices. Please note, after a few months your images go into the black hole of our back up system, if you want them pulled up again there will be a $55 fee to retrieve them from the archives. • If you have one of our concession cards it’s still important to book your spot on our Teeny Tiny day, as having the card doesn’t automatically promise you a session if the day fills up. If dates book up quickly we may look at adding more session dates, but to start with it will be first come first served.